Since the 1940s, researchers have been repeating claims about autistic people’s limited ability to understand language, to partake in imaginative play, and to generate the complex theory of mind necessary to appreciate literature. 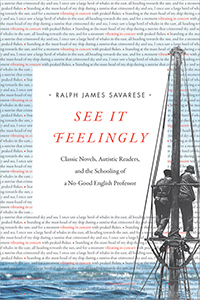 Ralph James Savarese, professor of English, challenges this view in See It Feelingly: Classic Novels, Autistic Readers, and the Schooling of a No-Good English Professor (Duke University Press, 2018). Over a period of years, Savarese has discussed fictional works with readers from across the autism spectrum and was stunned by their ability to expand his understanding of texts he knew intimately. Mixing memoir with current research in autism and cognitive literary studies, he celebrates how literature springs to life through the contrasting responses of unique individuals, while helping people both on and off the spectrum to engage more richly with the world.